San Francisco Ballet’s final mixed repertory program danced through the latter half of the twentieth century. The tour began with George Balanchine’s 1957 “Agon”, moved forward to 1966, and his “Brahms-Schoenberg Quartet”, and ended with Jerome Robbins’ “Glass Pieces” from 1983. A series of work from master choreographers; a perfect ending to a delightful 2014 season. “Agon” epitomizes the Balanchine style – deconstructed theatrical elements, Balanchine ballet vocabulary, stage patterns and dance architecture. Though “Agon” is known for the famed central pas de deux, the entire work is filled with moments of brilliance. When translated into Greek, agon means ‘contest’, yet the majority of the ballet is quite playful, even fun. In Part II’s Gailliard, Jennifer Stahl and Grace Shibley perfectly demonstrated the specificity of Balanchine’s technique. As they both extended their legs into a relevé long, they were careful to pay proper attention to every step of the process – first tendu, then attitude (with the knee higher than the foot), and finally, into full extension. In the Bransle Simple, Jaime Garcia Castilla and Hansuke Yamamoto outlined Balanchine’s intricate understanding of timing, through a complicated recurring canon. And then came the pas de deux, danced at this performance by Yuan Yuan Tan and Davit Karapetyan. It is in this duet that the ballet’s title comes through. On the one hand, Tan and Karapetyan are definitely working in concert, cycling as a team through the near-impossible Balanchine partnering. But at the same time, the choreography communicates a sense of control and struggle from both. While certainly slow and meticulous, ‘the contest’ was still very present and palpable. With “Brahms-Schoenberg Quartet”, the audience gets to see a very different side of Balanchine; a much more classical one at that. Separated into four individual sections, the underlying traditional esthetic is maintained, yet each also incorporates its own unique spirit. Led by Lorena Feijoo and Castilla, movement number one is elegantly mature, but not at all restrained. Maria Kochetkova and Vitor Luiz followed with a youthful, joyful variation. Flowy and romantic, the movement was peppered with surprising Balanchinian elements, like Kochetkova’s fouettés, featuring a forward working leg. Dores André and Joan Boada brought regality to chapter three. Boada’s tours en l’air were truly magnificent but the highlight of this vignette was Rebecca Rhodes, one of the three featured corps dancers. Rhodes exudes genuineness in every moment onstage, and has a keen awareness of what is happening around her. “Brahms-Schoenberg Quartet” closed with Sofiane Sylve and Luke Ingham leading the corps de ballet through a high-energy cultural folk dance. Sylve and Ingham were powerfully hypnotizing and the stage percolated with life, but this last movement seemed out of place with the rest of the ballet. 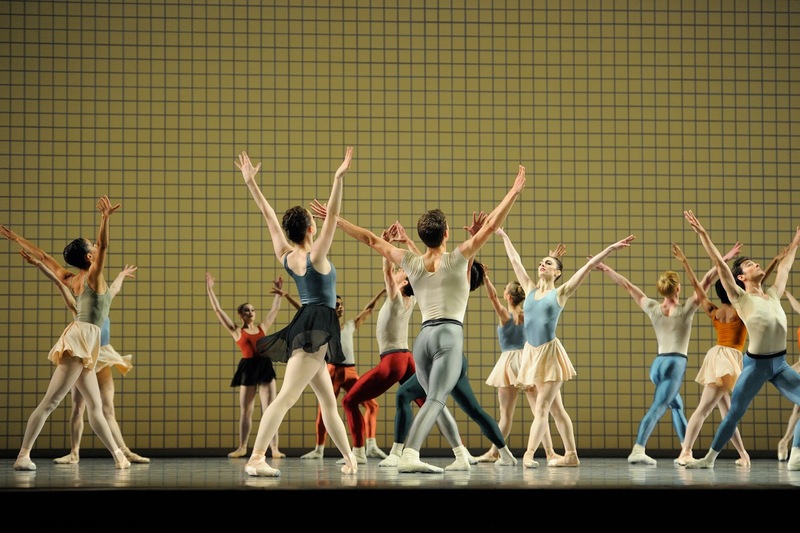 Program 8 closed with Robbins’ “Glass Pieces”, a contemporary ballet triptych about community. As the piece began, opposite forces became clear. While the cast walked quickly all around the space, three solo couples emerged. Order was being drawn out of commotion and hubbub; stylized movement out of egalitarian pedestrianism. The contrast continued as Kristina Lind and Tiit Helimets took the stage in ‘Facades’ slow, introspective pas de deux. Lind and Helimets expertly wove through the serious and contemplative variation – their long, lean extensions went on forever; their series of overlaid promenades, immaculate. The entire corps (led by the men) returned in the third movement, reinstating Robbins’ notion of community. Through a variety of stage patterns and unexpected choreographic surprises (the women’s arms in the circular turning sequence), “Glass Pieces” celebrated the collective, and each individual’s contribution to that group.